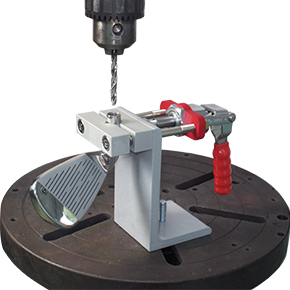 The Quick Reaming Vise is a clubhead vise used for re-drilling and reaming clubhead hosels. This is the perfect tool for correcting off-centered, too small, or too shallow hosel bores. Also great for drilling out broken graphite shaft bits. 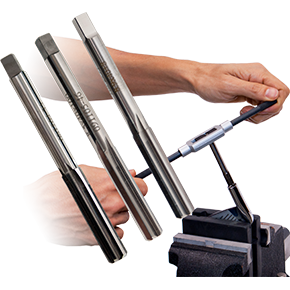 Excellent for finishing and re-conditionning hosel bores for re-shafting purposes. Finishes bores to a high degree of accuracy and surface finish. 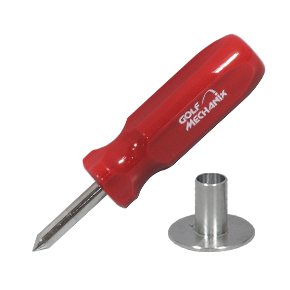 These GolfMechanix Straight Fluted Hand Reamers are made to exacting specifications and will provide an ideal allowance between shaft and hosel for the perfect epoxy bond! .355 Manual Straight fluted tapered Hosel reamer. For clubmakers who want the very best. 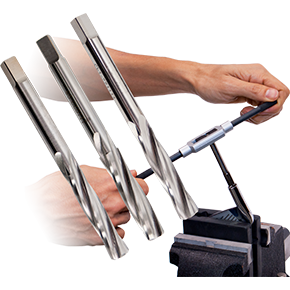 These manual Spiral fluted reamers are excellent for finishing and reconditioning hosel bores to a high degree of accuracy and surface finish. Specifications provide a good allowance between shaft and hosel for the perfect epoxy bond! Produced to GolfMechanix exacting standards, for re-boring hosels on clubheads made of notoriously difficult to drill metals such as 17-4PH, titanium and marraging steel. 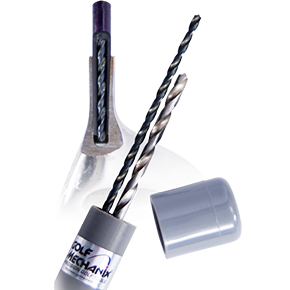 These HSS-Co alloyed and Titanium nitrated twist drills hold their rigidity and hardness at higher temperatures better than HSS drill bits. 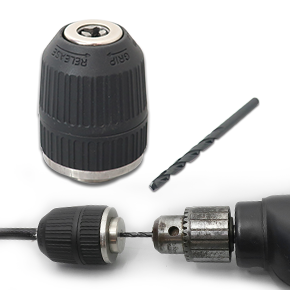 Specifically designed for the removal of broken shaft tips. Special thread will actually cut into shaft wall for a secure non-slip hold. High speed steel tool grade. Four flutes. NPTF thread. Super-hard stainless steel wire brush. Perfect for the removal of hardened glue and residue from inside the hosel of club-heads. 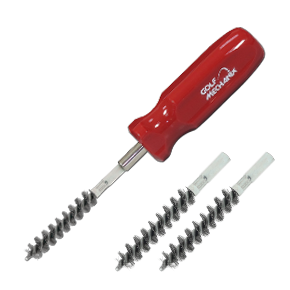 The wire brush features a short, stiff stem and a diameter optimized to prevent the strands from collapsing. The answer to abrading graphite shaft tips. Just a few turns and the coating is fully removed for a proper shaft bond. 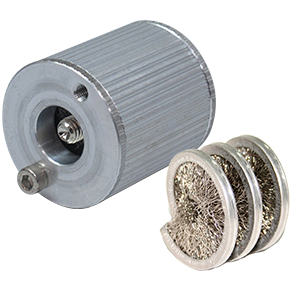 Special wound coil stainless steel wire brush and compression nut compensate for wear. One size fits all shaft tips. A “must have” 48 inch drill bit set for making swing weight adjustments on fully assembled clubs - steel or graphite shafted. 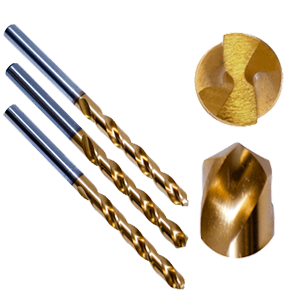 These drill bits are perfect for clearing out shaft tips, coring out excess epoxy glue, loosening weights and lightening up hosels quickly and effectively. This 48 inch ram-rod is perfect for packing cork and lead weight down the shaft. Also ideal for the occasional ramming of stubborn clubheads that will not easily come off shafts. 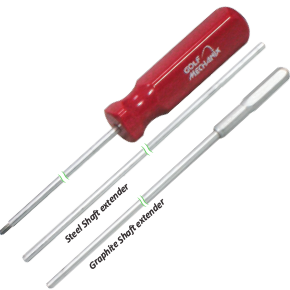 Hardened spring steel wire will not bend, break or kink. 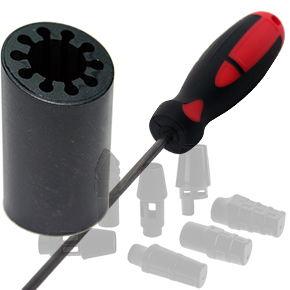 The Grip Cap Weight Chute is a handy little tool that permits down-the-shaft weighting without removing the grip. 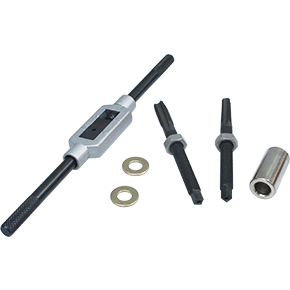 Universal Shaft Chuck is designed to be used as both a frequency analyzer weight and a shaft tip I.D. drill guide for unclogging epoxy when reshafting clubs. The 3.6 mm drill bit is included. This is one of the finest clubhead re-scoring tools available! Excellent for converting "V" grooves to "U" grooves. Two multi-sided tungsten carbide cutters will get the job done quickly and easily. Includes handle, 3-point blade and 6-point blade. Additional replacement blades available. This is an essential re-shafting tool for Callaway and Ping clubheads. 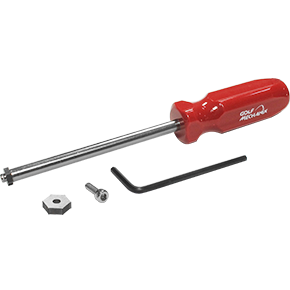 The ferrule shield protects and cools the proprietary ferrule while the head is being heated. The ferrule shield also provides a shoulder on which to push against. Click options for spacer only.